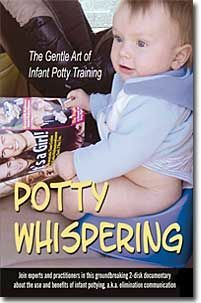 A two disk set of DVDs (each disk is 70 minutes) by Laurie Boucke with footage from many people around the world, published in 2007.
â€œPotty Whisperingâ€� is a 2-disk informational DVD set covering all the basics of infant pottying, including how it works, how to get started, techniques and tactics, medical and professional opinions, contributions from parents, and resources. This DVD set comes in a presentation slip case with printed guide to contents. It has been scripted by Laurie Boucke, author of â€œInfant Potty Trainingâ€� and â€œInfant Potty Basicsâ€� and makes extensive use of visual material from North America, Europe, Asia, Africa and Australia. Potty Whispering PROMOTIONAL VIDEO click here.